We look at how to measure and calculate absenteeism in the contact centre. Absenteeism is the percentage of unauthorised time that members of the contact centre team are absent from the floor. It is also known as “absence rate”. However, do remember that things like paid holiday and jury duty shouldn’t be considered as absenteeism. However, there are a number of variations to this formula, to calculate different types of absenteeism, the cost of absenteeism and more, as we explore below. 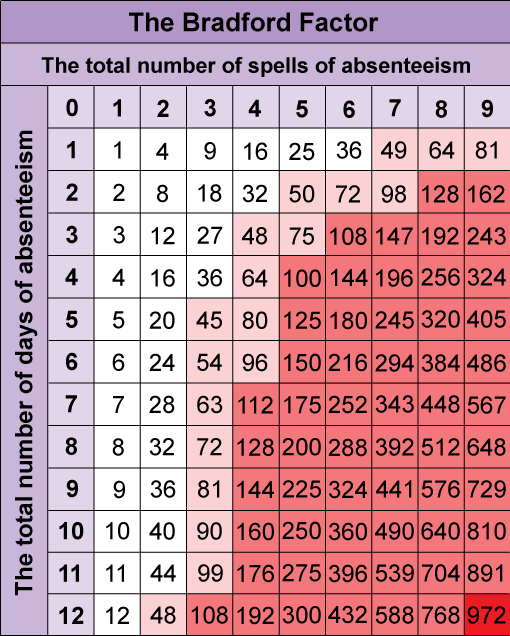 The trouble with measuring general absenteeism using the formula above is that it doesn’t provide you with a great deal of insight, other than a percentage figure. Not only does it lack insight, but the percentage figure can be misleading. This is because, while the absenteeism percentage may seem stable, the number of long-term absences could be decreasing and the number of absent employees may be on the rise. So, Martin Jukes, the Managing Director at Mpathy Plus, recommends splitting absenteeism into short-term and long-term absenteeism. Generally, short-term absenteeism is when an advisor takes up to five consecutive days off from work. Anything more would be considered long-term absenteeism. With this in mind, include all the hours that advisors were absent for a spell of time that was fewer than five consecutive shifts in one equation. Then, include all the hours that advisors were absent for a spell of time that was more than five consecutive shifts in another. By having two separate percentages, you can then separately assess any long-term absences and whether short-term absences are becoming an increasing or decreasing issue. This helps to remove the ambiguity from the overall percentage and gives you more insight into the underlying causes of your contact centre’s absenteeism. Martin Jukes is an advocate of measuring absenteeism monthly, due to the impact that absence has on Workforce Management (WFM) and therefore performance. Service levels will fall below your target with high absenteeism, meaning that customers wait longer, while if real-time service levels are presented to advisors on wallboards, they may begin to rush through contacts to relieve the strain on the contact centre, which will impact quality. However, if you can track absenteeism on a monthly basis, you will notice that it spikes during certain months and around major events. Knowledge of the percentage absenteeism that you can expect from month to month will help you to improve the accuracy of future staffing calculations. 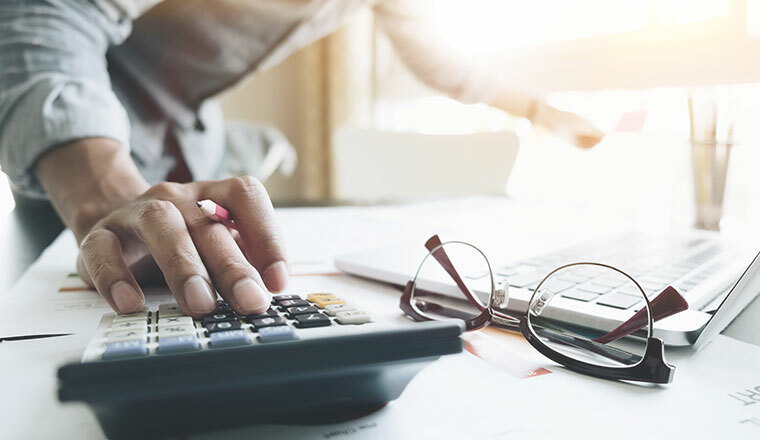 By accounting for absenteeism in staffing calculations, you can build flexibility into your schedules, which helps to reduce the focus on intraday management and the risk of understaffing. Many assume that absenteeism is spread evenly across the whole contact centre. Yet there may be teams where absenteeism is much higher than in others. Therefore, it can be useful to measure a percentage figure of absenteeism for each department in the contact centre. This will help to highlight where your problem areas are. If your contact centre has a very low absenteeism rate of one or two percent, you may think that it’s not necessary to measure absence rates for separate teams. However, what you may find is that it’s one team that is causing almost all of that two percent total. It is with this team where the focus really should be on reducing absenteeism. But remember, if you choose to incentivise attendance, do so for the whole contact centre. This will help to maintain a fair culture. Having a percentage absenteeism for short-term and long-term absenteeism, as well as absence rates across each contact centre department, enables you to analyse trends. These percentages should be combined with reasons for absence to give greater insight into trends in absenteeism. I’ve known organisations where people thought they were entitled to have a certain amount of absenteeism. Trend analysis will help to unearth these myths. Trend analysis will also help you prepare for future absenteeism, while it should also provide insight as to what you can do to reduce absenteeism. As well as calculating absenteeism as a percentage, many organisations find it useful to calculate the metric as a cost. This helps to bring value of attendance to light not only for you but also for the wider business and the advisors themselves. However, the cost will likely be much greater than this because this only works out the cost of resource time, but there are also “opportunity costs” that need to be considered. Yet there are still a number of benefits to simply working out the cost of resource time, as showing advisors a yearly figure of how much absenteeism costs the business can really bring the value of good attendance to life. The cost always gains more attention than the percentage. A financial value is more striking than a percentage, and managing cost is something that every business is interested in. If you highlight this cost when putting together a business case to reduce absenteeism, and highlight how your plan can cut these costs, you may be afforded more resources to help improve culture. Rather than measuring across the entire contact centre, the Bradford Factor offers an innovative way of measuring absenteeism on an individual basis. By attributing a score to each advisor, many contact centres use the score as a “trigger guide” as to when is best to start monitoring individual advisors and, from thereafter, start disciplinary processes. >45: Show Your Concern – At this point, the manager sits down with the advisor to have a general conversation about their absence. The manager should warn the advisor of disciplinary actions if they should be absent again over the next month or so. >100: Consider Disciplinary – This score is sufficient enough for the manager to start the aforementioned disciplinary actions. These actions may include formal monitoring, written warning and/or financial actions. >900: Consider Dismissal – Once an advisor reaches a score of 900, there is grounds for dismissal. If the manager/team leader has any objection, a final written warning should be given. If attendance fails to improve thereafter, dismissal is likely. To bring the Bradford Factor to life and to further highlight when action is required, here is a chart that uses Bradford calculations. 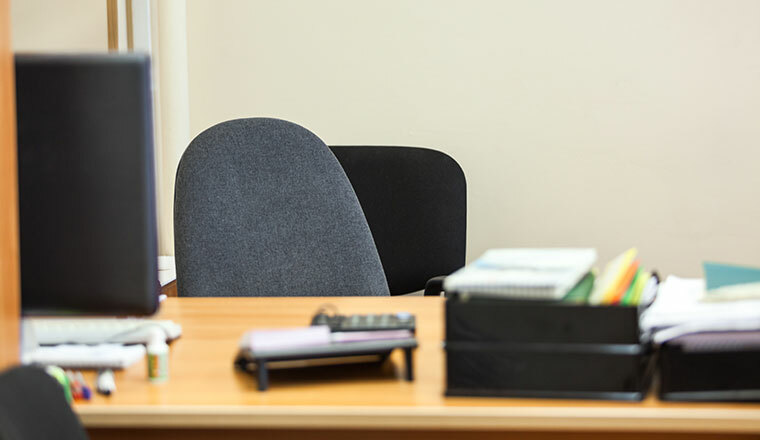 While the Bradford Factor can be great for tracking absenteeism on an individual level, be careful when using it, as it does not take into account disabilities or recurring illnesses. However, it is better than traditional methods of calculating absenteeism in the sense that it does protect advisors who have suffered from a freak one-off injury. This shows the value of calculating absenteeism using the Bradford Factor, as advisors who suffer from freak injuries will not suffer from the same negative consequences as someone who repeatedly takes time off. For those with a disability – which may impact attendance – or a recurring illness, make sure it is documented, so they are allowed greater leniency with their scores. When calculating absenteeism there are a number of mistakes that contact centres make, which can lead to inaccurate insights. Let’s take a look at three such mistakes. A breakdown of monthly absence rates should be passed over to the WFM team, so they can optimise staffing calculations. However, this shouldn’t just be the previous 12 months of absenteeism figures, but the last three years, as this will allow the resource planners to “weed out” any anomalies and account for trend. The absenteeism scorecard could also include schedule adherence, to highlight that this is how you mostly measure productivity, as opposed to unfair measures, such as Average Handling Time (AHT) and service level. Many contact centres calculate absenteeism as a “pat on the back” metric, if they have managed to drive it down. However, they rarely use the percentages to gain insight. The data should be used for WFM and trend analysis, to find ways of reducing business expenses. Too often return to work interviews just involve one question; “why weren’t you in?” But this conversation should be allowed to run a little longer. The more information that can be obtained from an advisor, the more it will help when you analyse trends in absenteeism, while it also helps to reinforce the importance of “showing up”. 1. Schedule dissatisfaction – Perhaps the team have to work occasional weekends, despite some really disliking having to do so. Or an advisor can’t find a shift-swap, so they have to miss a key family event. Time off and shift patterns are a constant source of frustration in some contact centres. 2. Lack of follow-up – An advisor may have taken a chance and taken a day off once, and observed that there was no detailed follow-up as to why they were away. So, this one-off might develop into a routine, whereby every once in a while, the advisor will decide to take a day off. 3. Culture – If people don’t like coming to work, they are less likely to come in. So, it is worth taking the time to invest in a positive culture, where fun is built in – perhaps through motivational games, charity fundraisers and afternoon pick-me-ups. 4. 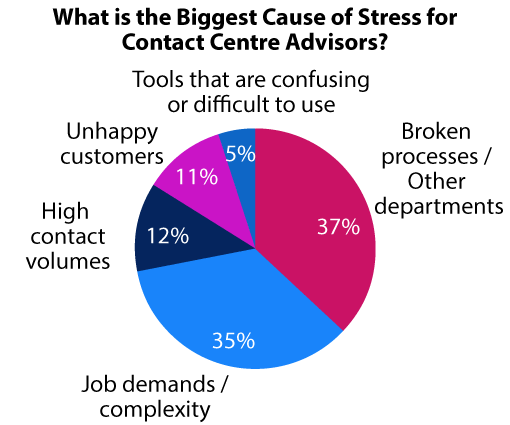 Stress – There are a number of sources of stress in the contact centre, including fire-fighting high contact volumes, job complexity and unhappy customers, which can lead to high levels of stress. But it’s broken processes that cause the most stress, according to our poll, and heighten absenteeism. If the team leader ignores any of these four messages, absenteeism could well spike. Ways of reducing absenteeism, such as presenting advisors with a cost of their absenteeism and including attendance rates on a scorecard, have been discussed throughout this article. Duvet days and shift-swapping – A lot of absenteeism is caused by schedule dissatisfaction. This highlights the value of shift-swapping and duvet days. If you give the team a certain number of duvet days each year – which can be taken at short notice, without explanation – it will provide them with valued, extra flexibility. Start-up an online community page – This allows the team to communicate freely with each other. It can also be used for recognising advisor achievements, swapping shifts and much more. Implement an open-door policy – An open-door policy is for managers and team leaders to encourage advisors to come to them with any problems or requests. HomeServe’s contact centre in Walsall have taken this one step further, as managers work in “pods” on the contact centre floor, just like advisors. Create a “go out and speak to somebody new rule” – This is a rule that is currently in place at Vax’s contact centre in Droitwich. Since being implemented, every member of the senior team has to start a conversation with someone they don’t normally speak to, in an effort to boost team cohesion. These four tips help to build team spirit and reinforce to advisors that there is somebody to talk to if something is wrong. This is a key to helping to reduce those percentages of absenteeism that we calculated earlier.